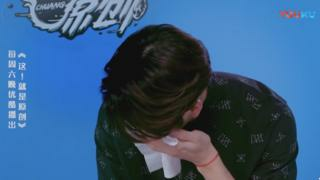 Image caption Hong Kong rapper Jackson Wang crying on talent show Chuang! What would you be prepared to sacrifice for a life in the spotlight? Hong Kong rapper Jackson Wang has sparked a debate on social media after admitting that he does not have time to see his mum and dad. Speaking on the talent show Chuang!, Wang burst into tears as he explained that he had drifted apart from his ageing father. Wang, who has multiple commitments as both a TV presenter, solo artist and is also a member of K-Pop group Got7, said: "I don't think I have any time to spend with my father." Social media users in China are now discussing whether high-profile figures are entitled to a personal life or whether a lack of free time is simply the price of fame. Some people have little sympathy for the 25-year-old's situation, telling him not to be emotional. "You sometimes have to lose something to gain something, you can't have the best of both worlds," says one user on the Twitter-like platform Weibo, in a post which has been liked more than 1,000 times. "I don't have a celebrity's wage, and I don't have time to go home and see my family," adds someone else. The hashtag, which translates as #ShouldStarsHavePrivateTime, has so far been used 6,000 times on social media. But the posts are not all dismissive of Wang's sorrow. One more compassionate posts has been liked 1,000 times: "He's been chasing his dreams and hasn't had time to spend with his parents. He feels guilty. This is human nature, and everyone should be merciful," it reads. And another user adds: "The nature of this star's work is that he needs to travel around, and his high income has meant he has to pay a corresponding price. "But there is no denying that he has the feelings of an ordinary person, and cares for his parents; I hope that he can spend time with his family and that people can be understanding." Before becoming a rapper, Wang was a sabre fencer who represented Hong Kong at the 2010 Summer Youth Olympics. He won first prize at the 2011 Asian Junior and Cadet Fencing Championships in his category. An emotional Wang told Chuang! that his father taught him how to fence and bought him his first blade, a gift that has remained dear to him. He said: "I gradually became better and better, but as my dad and I slowly got older [he breaks down in tears] my dad and I slowly drifted apart. "I've reached the top in a number of things, but I've also discovered that it hasn't made me happy. "The most precious thing is not my Olympic uniform - it is that blade." When Wang was 17 years old, he moved to South Korea to pursue a singing career and joined Got7 in 2014. He says he has had little time to return home with work commitments, which also include judging reality talent shows. Celebrities in China are under huge pressure and can face a great deal of scrutiny which could also account for Wang's lack of time. Last year Chinese actress Angelababy was criticised for only being soaked with water once in comparison to other contestants during a reality TV show. She explained: "This was the first day of my period, and I was really uncomfortable. I never said that I couldn't go in the water, it really wasn't fun sitting in that chair."